Herman was born in Holland in 1940. In 1952, when he was eleven years old, he immigrated to Vancouver, B.C. along with his family. He was first seduced by clay in 1962 at University of Michigan ceramic courses taken to complete a Bachelor of Fine Arts Degree at Calvin College in Grand Rapids, Michigan. At U.B.C. from 1963-1965, he took additional Education and Art courses, including pottery taught by Stan Clark. After teaching high school Art and English for three years, he took advantage of an opportunity to study under Carlton Ball at the University of Puget Sound, Tacoma, Washington, earning an Master of Fine Arts Degree in 1970. That same year he, along with his wife Joyce and three preschoolers, settled on Harris Road in Abbotsford, and began to build a studio. During the following years he worked as a production potter, did workshops, and taught part-time, both privately and for Fraser Valley College Department of Continuing Education. Since 1982 he has variously taught high school Art and English, built houses, worked as superintendent on school construction sites, and potted and taught part-time. 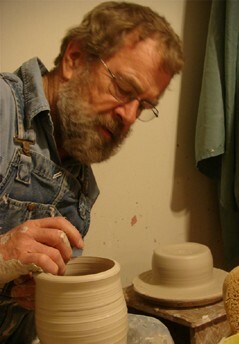 Since his retirement in 2005, he has refurbished the studio and showroom, teaches, does workshops and plays with clay again.